These are our favourite castles in Ireland – but I must admit, we have limited our selection to Irish castles that we have been to, photographed and enjoyed. I’m sure you have your own – some may be on our list and others may only be on yours! Did your Gaelic/Norman family occupy a castle in Ireland at some stage? 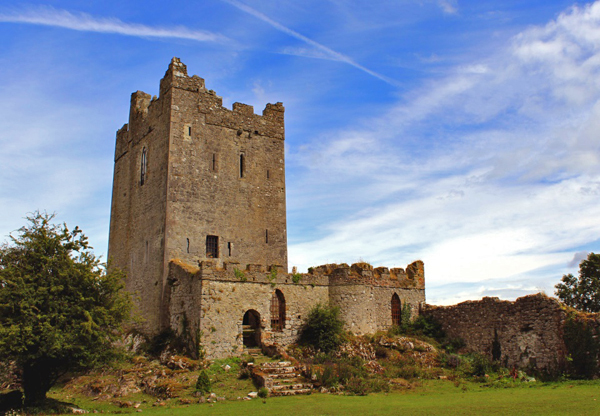 Tower castle building was introduced to Ireland by the Normans on their arrival in the late 1100s. 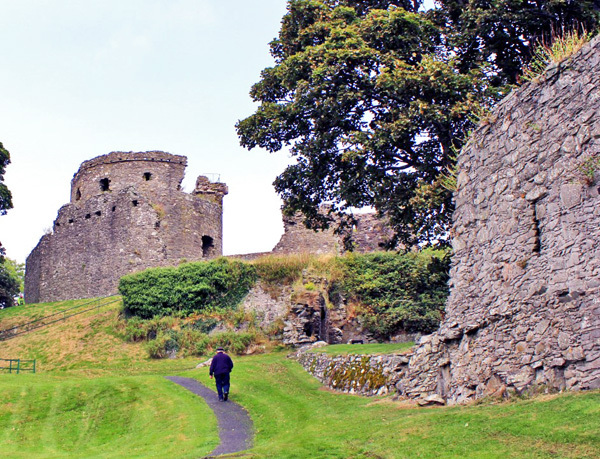 This type of castle is quite rare in England and Wales – but you will find them in the more “dangerous” parts of the world – Ireland and Scotland! The Gaelic Chieftains got in on the castle-building act from the 1300s onwards – mostly copying the original Norman style. These castles would have been lived in until the mid 1600s in many cases when Cromwell’s forces arrived and sacked many of the intact castle towers around the country. Trim Castle was one of the first (and largest) castle built by the Normans to protect the extent of the colonist territory around Dublin – in this case to protect the Lordship of Meath. It was built by Hugh DeLacey in 1172 – and has been extended many times over the 1200s and 1300s. It was recently listed by National Geographic as one of the top ten visits in the WORLD that will change your childs life! The tour of the castle is absolutely wonderful and a real trip back in time. 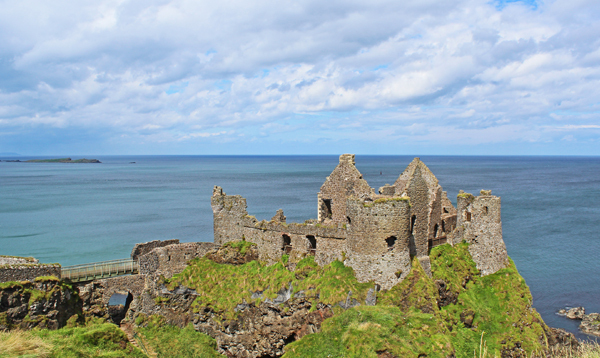 This must be one of the most photographed castle ruins in Ireland (if not the world). And the nice thing is you can see it prominently from luxury of your car or coach as you drive the north Antrim coast. But it is well worth getting out and having a look. It was built by the Norman de Burghs (Burke) on the site of an earlier fort – but passed to the McQuillans by the 1500s and after that to the McDonalds. That is the way with so many castles – they pass hands through the centuries as they typically occupy a strategic position that is worth fighting for, winning – and defending. 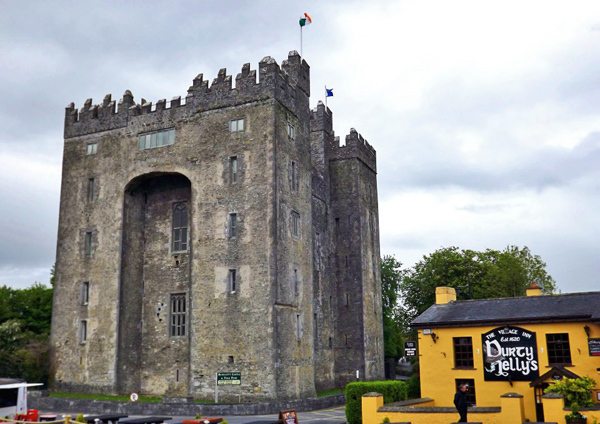 Today, Bunratty is associated with having a good time! Either strolling around the nearby folkpark, having a drink or two in Durty Nellys – or stepping into an atmospheric banquet in the castle itself later in the night. 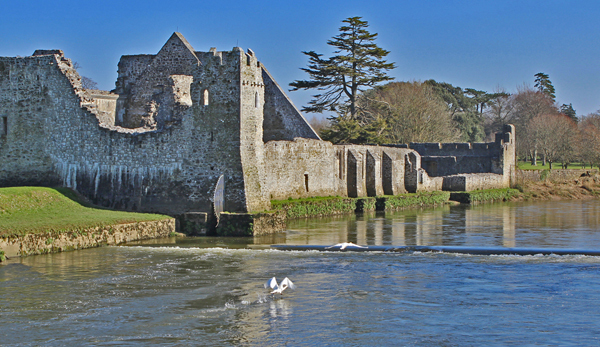 Bunratty was originally a Norman castle from the 1200s – and lived in by Richard de Clare – ruler of all of Thomond. The name of the County Clare comes from the village of nearby Clarecastle – which in turn took it’s name from Richard’s family. The castle we see today was built by the McNamaras – and passed over to the O’Briens in time – with whom it is most associated today. It became their main seat when they were Earls of Thomond. Kilkenny castle was another Norman stronghold originally. It was started by William Marshall in 1195. I have seen Marshall referred to as the “most important knight in all of christendom” and his life is indeed fascinating – you should look it up! He was the main instigator of the “Magna Carta” in England – which provided a template for the “Rights of Man” across many countries over the centuries. The Norman family of Butlers (originally FitzWalter) bought the castle in 1391 and it is most associated with them as Earls of Ormonde – the last Butler leaving the castle in 1935. This castle also provides wonderful guided tours. 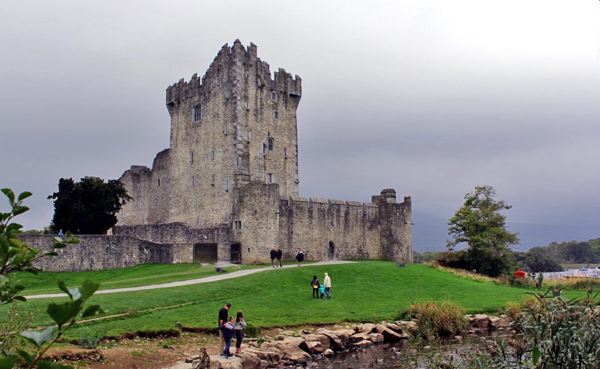 Ross Castle in Killarney was built in the late 1400s as the main family seat for the O’Donoghue clan – who ruled the Killarney area at the time. The surname has a strong presence in the area right up to the present day. It has a very striking presence in this corner of Killarney National Park on the shores of Lough Leane. If you do make it here, be sure to explore Ross Island just behind the castle – the site of fascinating copper works for thousands of years. 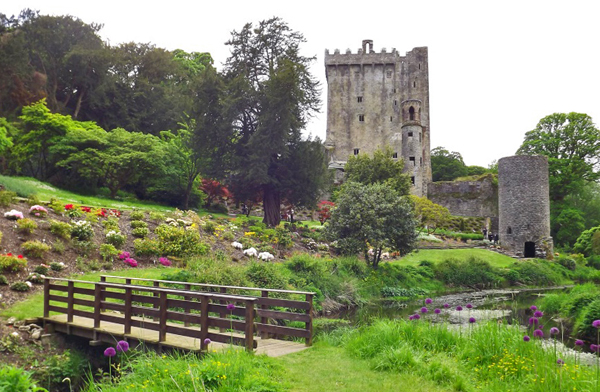 Here’s a picture of a castle you may have heard of – Blarney Castle in County Cork (anyone kiss the famous Blarney stone?). It was built around 1480 by Cormac MacCarthy – Lord of the Muskerry branch of the MacCarthys. He was slain by his brother Eoghan in 1495 – while he in turn was killed and succeeded by Cormac’s son – Cormac Óg – in 1498. That’s families for you! I think this must be in the top 10 tourist sites to visit in Ireland – but I do know of quite a few tourists who are shocked by the narrowness and steepness of the staircase as they look up through the interior of the castle – and decide they talk plenty enough already! This is also known as “Carriagahowley castle” – and is linked with Grace O’Malley. In the year 1530, Grace O’Malley was born around the shores of Clew Bay in County Mayo. Her family took it’s name from the country and tribe of Uí Maille – and Grace was to become known as both the Queen of Uí Maille and the Queen of Connaught during her lifetime – and was later popularised as the “Pirate Queen”. In 1566, Grace O’Malley got married to Richard Bourke. The Bourkes were the overlords of the O’Malleys and this – a second marriage for Grace – was probably motivated by her ambition to grow her wealth and standing. 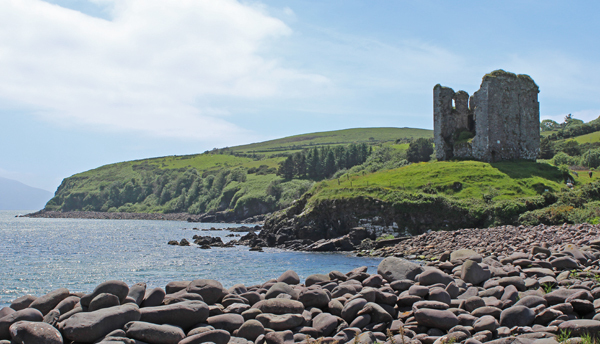 Bourke was owner of Carraigahowley Castle, located in a sheltered harbour – very suitable for the hiding of pirate ships. After one year of marriage, O’Malley and her followers locked themselves in Carraigahowley Castle and and Grace called down to Burke, “Richard Burke, I dismiss you.” Those words had the effect of ending their marriage under Brehon Law, but by that law she got to keep what was in her possession – including the castle and lands around it.Grace went on to live for many more decades – based out of her new stronghold. She most likely died at Carraigahowley Castle around about 1603 AD. I chose this castle simply because of the wonderful setting and views. 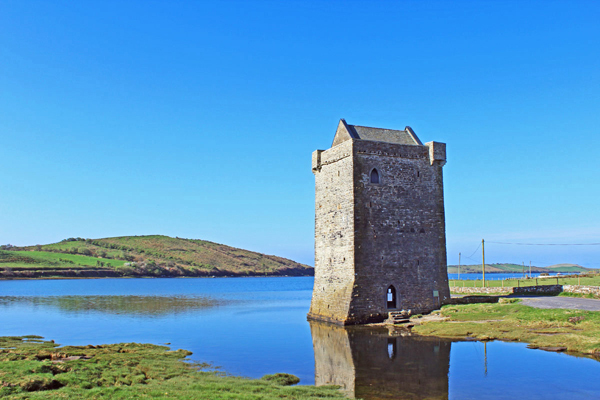 It has views across to the Iveragh Peninsula (still in County Kerry) and is a Fitzgerald/Fitzmaurice castle from the 1500s. The large boulder beach, thrown up by the sea during storms – really sets of the location very nicely. If you do manage to make it to this remote location – you may well find you have the place to yourself. Thoor Ballylee Castle, County Galway. The Norman de Burgh family (Burke) were the most prolific builders of Irish Castles by a long way. 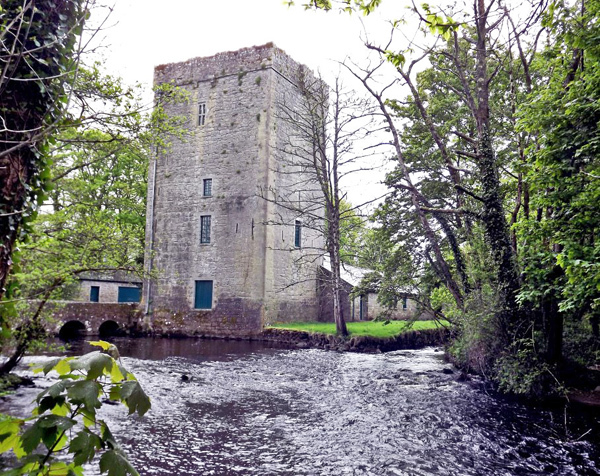 Here is another of their tower houses in Connaught – Thoor Ballylee Castle. But I chose it for the associations with the poet W.B. Yeats who purchased the property in 1916 from the nearby Gregory family. Here is the wonderfully named Carrigaphooca Castle which translates as “Castle on the Rock of the Fairy” near Macroom in County Cork. It was built 1436 by Donal McCarthy of Drishane – and in 1602, the castle was taken by Donal Cam O’Sullivan Beare – who was based further west down the Beara Peninsula. The area is heading into the modern-day “Gaeltacht” area of Cork – where Irish is spoken by a majority of the residents. It’s a really beautiful area of the country – with a feeling of wildness and magic never too far away. 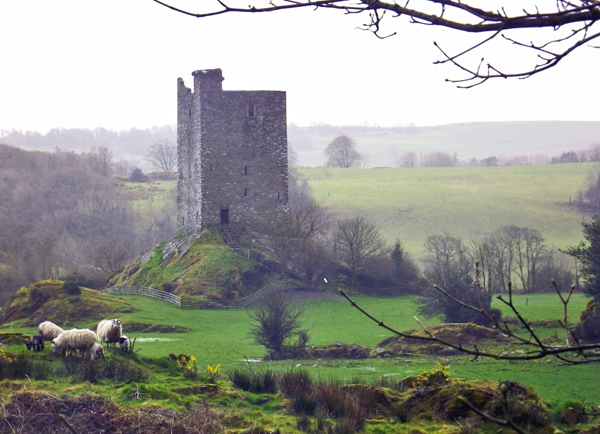 It’s easy to zoom by this castle on the road from Macroom to Killarney – but almost everytime I pass it, it presents a different vista in the changing light. Fairies at work, I guess! High praise indeed from an English man! 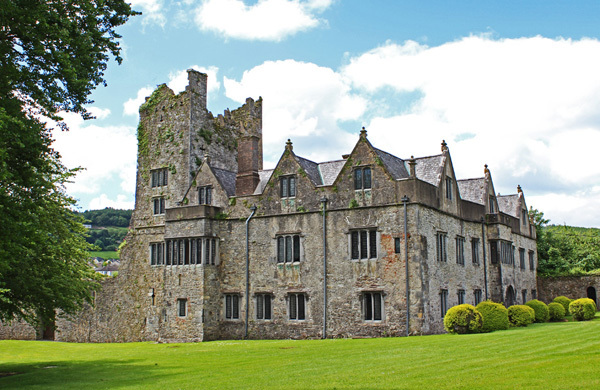 The leaders of the O’Donnell clan left Ireland in the early 1600s following the Battle of Kinsale and the castle was granted to the Brooke family. You can see the parts that they added in this picture – prominent windows and a manor-house wing in the Jacobean style. An earlier castle was probably built on this spot by the O’Donovans before they headed to West Cork in the early 1200s for good (to join their cousins, the Collins‘ – my own family). One of their main reasons for leaving was the encroachment of the Norman Fitzgeralds – soon to be Earls of Desmond. 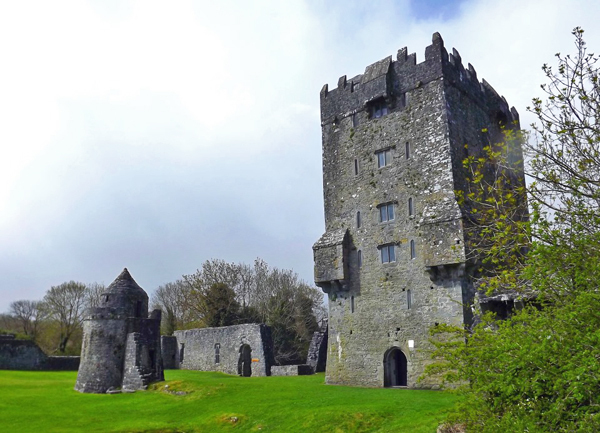 This became known as Desmond Castle – in the picturesque village of Adare – over time. One of the very best settings of any castles in Ireland. Just beside the village of Kinvara – in south County Galway – this was the seat of the O’Hynes/O’Heynes family – and later lived in by the Martins. In 1922, the poet Oliver St. John Gogarty restored the castle as a meeting place for leading figures of the Gaelic Revival, including household names like the poet W.B. Yeats and playwrights George Bernard Shaw and John Millington Synge. Today it is open to the public for nice ramble around and also holds some nice evening banquets. But, if you have a camera – the main attraction is spending and hour or two photographing the castle from every possible vantage point! Another McCarthy Castle. I love this castle as it is in sight of my own father’s house across Roaringwater Bay. As a young fellow, I crossed the channel and climbed the ruin a few times. Later it was bought and restored to this fabulous condition by the actor Jeremy Irons who lives there most of the year and takes part in many of the local community events. Good man Jeremy! A castle with two faces in Carrick-on-Suir in County Tipperary. Thomas Butler, Earl of Ormonde was a cousin to Queen Elizabeth 1 through Anne Boleyn. Apparently, he also had a bit of a “thing” going on with her (Elizabeth that is!) He built this manor-house extension onto his already existing castle (quite unique in Ireland of the time) for a planned visit by Elizabeth – and while the extension was built, the planned visit failed to materialise. 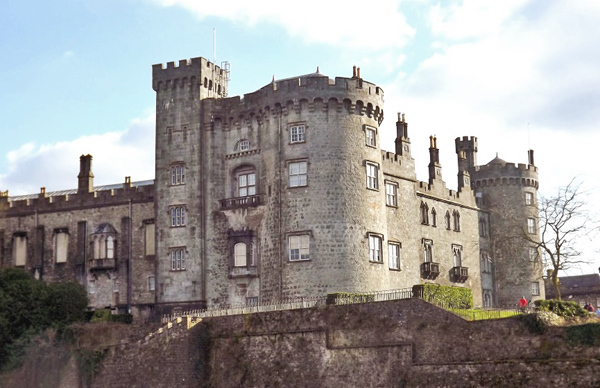 It remained (like Kilkenny castle) in possession of the Butler family until the middle of the 20th century – and was then handed over to the State. It is open to the public today and offers a fine tour. Situated above Newcastle in County Down, Dundrum was built by the norman John DeCourcey in the early 1200s. 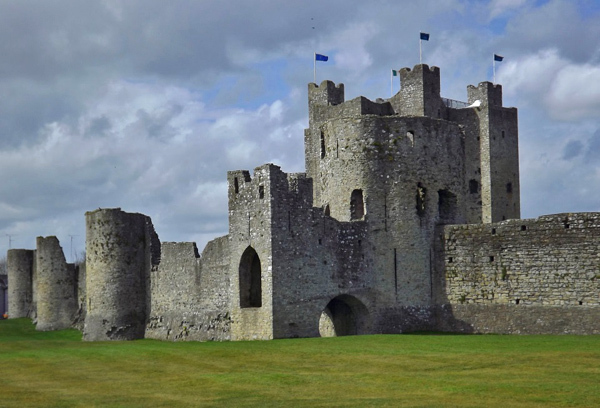 It was later taken over by Hugh DeLacey (see Trim Castle) and even later by the Magennis (related to the modern Guinness family) family in the late 1400s who held onto it until 1601. It is mostly ruins today but is in a wonderful setting high on a hill overlooking Dundrum Bay and the Mourne Mountains. What a wonderful looking – fairytale-like – castle. Overlooking the Aran Islands on the coast of County Clare, Doonagore was built by the O’Connors of the Burren in the 1300s – and then “moved” onto the O’Briens and after that “moving” onto the Clancys. It later moved on again to the Nagle family and was, in modern times, bought and restored by the O’Gorman family. One castle – many names! 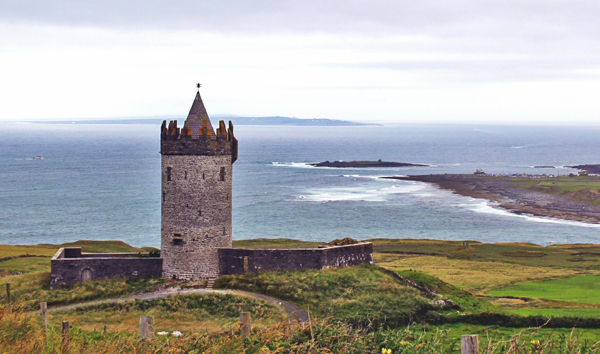 Although it is in private hands, the castle provides a romatic backdrop on the road from Doolin to the Cliffs of Moher. The Rock of Cashel, County Tipperary. What can I say about the “Rock of Cashel”? Quite a lot, apparently! 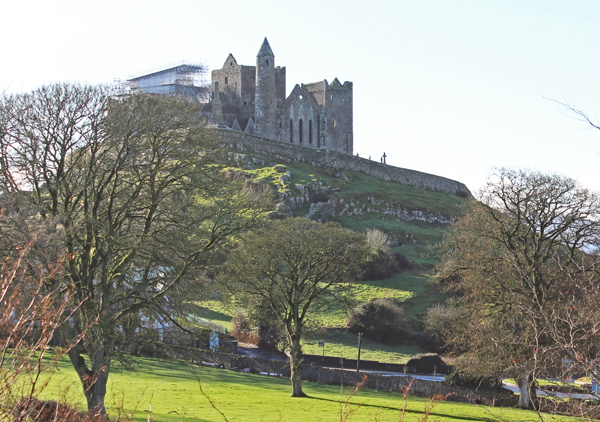 The Rock of Cashel was the seat of the kings of Munster for several hundred years prior to the arrival of the Normans. It was first held by the McCarthys in this capacity – and later by the O’Briens. Although the “Castle” part is just one part of this overall complex, I thought it was important to leave in our list. The majority of buildings (Cathedral, Round Tower, chapel) on the site date from the 12th and 13th centuries. I always remember the sight of the Rock as we rounded the old road from Dublin to Cork coming into Cashel on a summer’s evening – it was awe-inspiring – even then as a child. I can just imagine the effect it must have had on people as they saw it for the first time a thousand years ago. The Rock of Dunamase Castle, County Laois. This is a wonderful site located just off the motorway near the town of Port Laoise. It’s in a dramatic location – on a rock overlooking the plains to the west – and the valleys and hills of Carlow to the west. Legend has Dunamase playing a prominent part in Irish history. The Normans arrived in Ireland at the invitation of Diarmuid MacMurrough – the deposed King of Leinster. He was deposed shortly after kidnapping the wife of Tiernan O’Rourke, the King of Briefne – and bringing her here to hide in Dunamase. 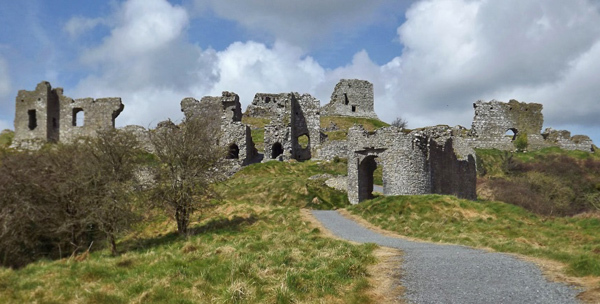 When the Normans arrived in Ireland in the late 1100s, they built a castle here in Dunamase and it passed into the hands of William Marshall from his father-in-law Strongbow and then passed to the Mortimers by inheritance before being taken over by the Gaelic O’Mores. However, it appears to have been unused since the 1350s. But if you do have 30 minutes to spare on the road from Dublin to Cork, be sure to call in and breathe in the unique atmosphere of this lovely spot. I love the way this castle has been preserved and restored by it’s current Canadian owner. It looks of it’s time (at least the way I imagine it). We passed by one day and called in for a chat – taking lots of photos. The castle built by the MacCoughlan clan, but came into the hands of Thomas Boleyn – father of Anne Boleyn of Henry VIII fame. 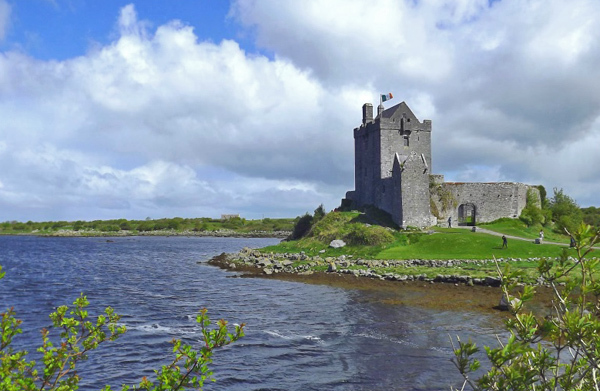 This is a wonderful Castle to visit on the edge of Connemara – not too far from Galway city. It was built by the O’Flahertys of Iar Connaught – or Connemara. They were the leading sept of that area – with a smaller grouping in County Kerry. Up to 1245, the O’Flahertys had a fortress at “Bun na Gallimhe” – where the modern city of Galway is currently situated, but they were driven west into Connemara following battle with the Normans. As the new Norman town of Galway was built, the O’Flahertys were a constant threat – always eager to recover their old lands. One of the more famous characters to emerge within the O’Flaherty clan was Grainne Mhaile – Grace O’Malley. In 1546, Grace O’Malley – daughter of the Chief of the O’Malleys – was married to Donal O’Flaherty, heir to the chiefdom of the O’Flahertys. But as Donal and Grace settled down and had three children, Donal was beaten to the Chieftainship by his brother, Morogh. Nobody is quite sure how, but when Donal died, Grace assumed the power and authority of her husband – and became the female chief of the western O’Flahertys. With her swift boats and allegiance of her people, she dominated the waters around Galway for many years. Grainne eventually returned to O’Malley territory in Clew bay in County Mayo (and another marriage to a Burke), and left her two sons behind to run things – Donal and Moragh na maor. Have a look at Rockfleet castle on this page to see how she lived out her days after her final marriage. Connemara remained in O’Flaherty control for 450 years until the mid 1600s. Caher castle if probably one of the most castle-like castles in Ireland! It was started in 1142 by Conor O’Brien – then King of Thomond (north Munster) – and by 1375 was in the hands of the Butler family – the Earls of Ormonde (East Munster). The O’Briens came on the scene again in the late 1500s when they besieged it from the Butlers who were the Lords of Cahir at that time. It came into the hands of the O’Briens who surrendered it intact to Oliver Cromwell in the 1650s. This left it as one of the best examples of an intact castle on this island. It has been used as a backdrop in a number of movies including Excalibur. 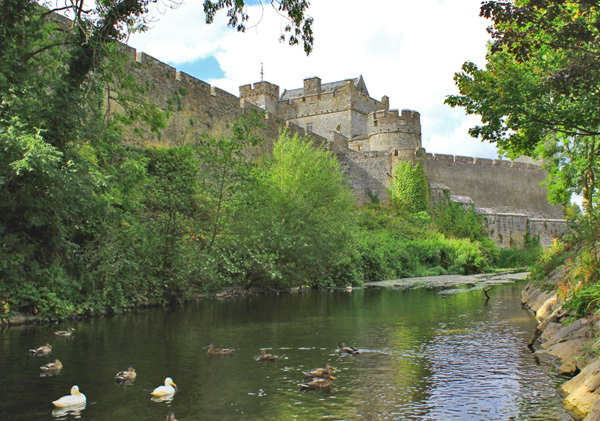 That’s it for our trip around our favourite 22 Castles in Ireland. Do feel free to comment and add your own favourites below – I’m sure I’ll be back to modify and add to this list over time. After all, the list can grow to almost one and a half thousand castles on these shores before we run out! 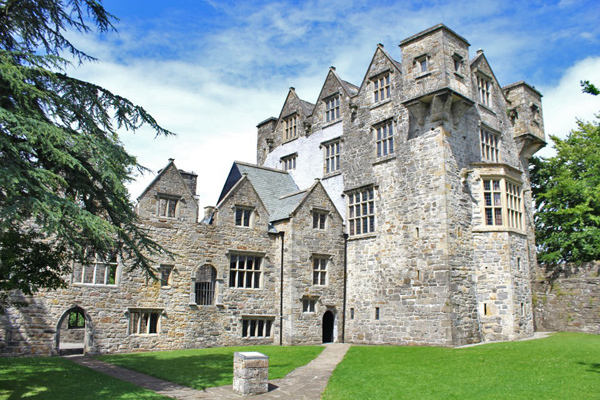 Do you have any history on Tulira Castle in Gort , Co. Galway ? Hi Susan – built by the Burkes and lived in by the Martins also – and it is for sale at the moment! Mike. I visited Waterford Castle (where Strongbow resided) which is now a resort and is on it’s own island, and Lismore Castle with it’s stunning gardens which is privately owned! Beautiful spots alright Fran – thanks for sharing! Mike. Fantastic resource, thanks for posting this. Great pictures and a pervasive sense of history throughout – really informative. Readers might be interested in this site about “Ireland’s Pirate Queen” Grace O’Malley, presented by author Anne Chambers. Love the pictures of castles in Ireland. I have never seen any pictures from Wexford County. Maybe they don’t have any castles. Hi Elaine – actually, Wexford has a huge amount of Norman castles. This is the place the Normans landed and reinforced for hundreds of years after their arrival. There is a wonderful book all about the Castles of County Wexford. Mike. What is the name April? I am a Talbot and loved visiting Malahide to see the amazing history of my kin who lived here 800 years! My grandfather immigrated to the USA from Kilkenny in the 1860’s and I was fortunate enough to visit Ireland a couple of years ago. I felt my roots very deeply especially during my visits to some of the castles especially Blarney and Bunratty. Had a little too much libations in the banquet at Bunratty, but hey even that is a great memory. Thanks for the excellent review. You’re welcome Ronald – thanks for sharing those memories! Mike. My husband and I were fortunate to see 5 of these22 castles. Now, I have chosen 5 more that I would love to see, if I ever get the chance to return. I am honored to have been to Blarney Castle, Bunratty Castle, Thoor Ballylee, The Rock of Cashel, and Dunguaire Castle. I would love to see The Rock of Dunamase and Leap Castle! Nice collection Jude – I would like to visit Leap myself! Mike. Just a note did you happen to know tgat Dun Luce castle is the castle featured on Led Zeppkins Album Houses oc thd Holy? my Mother waz a McQuillen.If my ship conez in a Du Luce restoration is in order 🙂 Not counting my sheckled yet though lol…. Apparently I cannot spell Antrim on first try….Sigh…. We visited Dunguaire a few years ago, searching for more information about Hines/Hynes/O’Hynes. Did they live in the castle or build it for the king? Our family is traced to Bryan Hynes in Ballycumber, County Offaly but I could not find his gravesite. He married a Maher, is there another spelling for that? Also in our lineage is McLaughlin, is that the same as MacCoughlan (also from Offaly)? Thanks, loving this site! I am part of the O’Heyne Clan. I love seeing the beautiful pictures of my ancestors native land. My great grandfather was born in Ireland. His name was Patrick O’Rourke (born 1843). What can you tell me of Tiernan O’Rourke, King of Briefne and a castle with the name O’Rourke? Hi I have traced my MacGeoghagen ancestry dates back to 1020. I believe the first Macgeoghagen to be recognised was Conglach Mor Mageoghagen who was Lord of Keneleagh and died in 1291. I have married up the genealogies from a lecture given by Liam Cox on 10th Jan 1969 to my searches on Ancestry.com. We are supposed to be descended from Fiacha, son of Niall of the Nine Hostages. Our territories from a map of 1567 includes Kinaliaghe, Faly and Athlone, Mullingar, Westmeath. Other names that connect are: Murtagh Mor, Wm Galida, Diarmaid MacG, Lord of Kenaleagh and Feargal Rua. The clan was named Cenel Fhiachaigh and possibly had a castle at Moycashel and Laragh near Roscommon. I have connected these ancient names to my Grandmother Maria Geoghagen b. 1883 d. 1953 who married my Grandfather Thomas Patrick Tobin b. 1872 d. 1909. I think some Geoghagens are interwined with the O’Briens and O’Driscolls. As for the Tobin side somewhere in history we are related to the St Aubyns clan who originated from France. The St Aubyn name changed to Tobin over a period of time. The Tobins became Barons of Cumsey. The first member on record is William de St Albino in 1204. So far I have not been able to make a connection with the present day Lord St Leven who runs Saint Michael’s Mount. So much to tell. Hopefully the above will connect me with another Geoghagen or Tobin. Your photography is superb. Love all the castles, along with the existing grounds shown and some of the history of each one. When we visited Ireland, we got to visit a few of these and saw several others. Bunratty was one we saw from the road but we did get to sample the mead. Desmond was in walking distance from where we stayed in Adare but it wasn’t open for visiting during the time were there. We did get to visit Blarney but didn’t get to see much of the inside because the line of people waiting to kiss the stone extended all the way down to the ground floor entrance and it wasn’t moving. I don’t remember seeing Ross Castle but see the Muckross estate and learned of a disastrous visit there by Queen Victoria. We also visited King John’s Castle in Limerick. I wonder if the Rock of Cashel was the inspiration for Casterly Rock of the Lannisters in Game of Thrones. Thanks for the tour. Very nice. Have been told rumors about our family name being associated with a castle…. could you point me in the right direction to find the truth about this? Great article, too item on my bucket list is to visit Ireland and see some of these myself! Loved the pictures of Irish Castles. Have always wanted to visit there. I am now 89 years old. Are there any McClellan Castles in Ireland? My ancestors came from Country Antrim, so I’m sure they saw the castle there. They were supposed to have left Scotland and settled in County Antrim before coming on to America in the 1700’s. 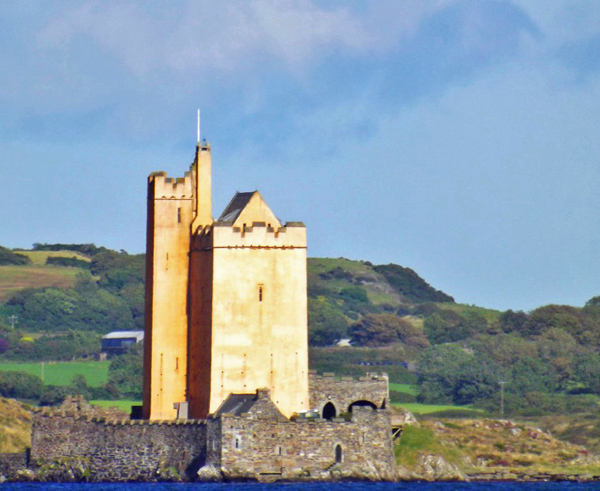 There is a McClellan Castle in Scotland, but are there any in Ireland? There has been a tale of the McClellans leaving 2 million dollars to the McClellan heirs in America, but they couldn’t be located. Interesting, but I have no idea if it is true. Hi I understand there is a big reunion of the O’Dea clan next year to remember a battle if 1418 against the english King do you have any information on this. Heres the link, Jane: http://odeaclan.org/ Mike. Delighted you found it of interest Jerry!